With Air Jordans, you never know what's going to be retro'd. Sometimes they'll drop something crazy like the Aqua 8's that came out on Black Friday last November. Other times the kids aren't exactly messing with them, like when they brought back the classic Maroon 6. But regardless of the love or hate, Jordan Brand will always be Jordan Brand and that equates to crazy sales figures. Think to the tune of billions. These folks were lined up at the opening of Nike's 'Jordan Store' in Chicago. The rain didn't stop them! Nike announced today that Jordan will be bringing out another classic from their wheelhouse for a Retro. This time around, they're going with the coveted Air Jordan 11's aka "The Space Jams." Remember these? Beautiful. Funny enough though, they're basically the same colorway as the movie poster. Now if you've never seen the movie Space Jam, you're trippin'. Go watch that tonight. No Netflix and chill though, you need to be taking notes on an important part of '90's culture. They had the biggest ballplayer at the time (maybe ever), Bill Murray, Bugs Bunny, the MonSTARS, Newton from Seinfeld, Larry Bird, and a whole squad of other famous players. This is an actual screen shot of Bugs, Michael, and green dude in a purple suit rockin' slides out on the court. 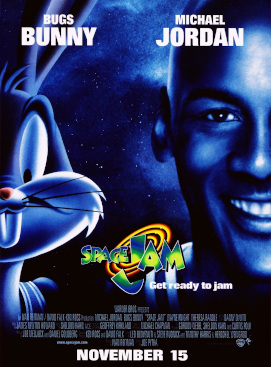 Basically, somebody thought a movie starring MJ and Bugs Bunny was a good idea. Maybe it was a good idea, maybe it wasn't, but we were blessed with some of the hottest XI's to make their way into production. The Space Jam 11's were Retro'd back in 2009, but as one might expect, they went fast. So as the custom sneaker community does best, they put Angelus Brand paint to work and created some of their own. Let's not forget these amazing XI lows that Dank did back in 2013. Dude was like fortune teller when he made these custom sneakers. While the Retro Space Jam 11's that are going to drop later this year will no doubt be the hot item, they're not going to have that same artistic soul that these 1 of 1's will have. When you find yourself waiting in line with the other Jordan devotees, be sure you remembered to pick up some Lace Lab XI Rope Laces. Because if you get into a pick up game with some goons, this might be you.